Contributed by Mistress Aife ingen Chonchobair in Derthaige. My husband, Joel of Vestfell, and I told Mistress Lylie that we were willing to be her cooks for Coronation some time during War of the Roses. Joel and I are a very well-balanced team when it comes to cooking. I’m better at ideas, while he’s better at large-scale execution. Additionally, he’d been reading medieval cookbooks for fun. So we collected up our cookbooks from the appropriate time period (including ordering a copy of Libellus De Arte Coquinaria: An Early Northern Cookery Book to give us some Danish options for recipes). They went with us on vacation this summer, where we spent a few evenings reading and discussing possiblilities. We decided that we wanted to make it as appropriate to their personas as we could manage, while still making some modern and logistical concessions. Chiquart’s “On Cookery” talks extensively about planning a feast with the health of the participants in mind. (Slightly late for where we were aiming, but not too far and very useful.) We also referred to the English translation of Regimen sanitatis Salernitanum a bit. Our first course had “lighter” foods starting with slyt (leek) soppes to “prepare the digestion.” We included smoked salmon made by my apprentice brother, Magnus Hvalmagi, as well as a 13th century Danish recipe for chicken cooked in wine and onions. Lastly, we included fried spinach (from Forme of Cury) to add an appropriate vegetable dish. We planned two solelties – one as an entrement between the first and second course, and one as part of dessert. The first was a “Fish Three Ways,” as referenced by Chiquart and originating in Le Viandier de Taillevent. This was originally one of four dishes at the base of a tower, all of which were breathing fire. We decided to not go quite that crazy with it. Taking an entire fish, dividing it into three sections (head, middle, tail) each prepared differently (grilled, boiled/poached, fried), and then reassembling it for presentation with three separate accompanying sauces was challenge enough. We used bluefish that we acquired from the fishmonger at the Troy Farmers’ Market. (Most of our vegetables also came from the Troy Farmers’ Market. Our farmers and fishmonger gave us fresher ingredients and a bulk discount that actually made it less expensive than our other possible sources.) Our only public flaw was that our timing got slightly off on the fish, delaying it until after the second course. Our second course moved into the heavier foods, according to medieval convention. That said, we still tried to balance the course with enough vegetables to be conscious of modern dietary convention. All of these recipes were from Forme of Cury: Cormarye (Pork tenderloin, rubbed with garlic and spices and cooked in wine), Gourdes in Potage, Tart in Ymbre Day, and Funges. I referenced Pleyn Delit for the redaction of the tart, only altering to use powdour douce for the spicing, as called for in the original recipe. 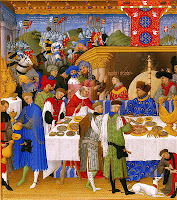 (Powdour Douce was in three recipes in this feast. It was my own blend, which I’m okay with since like most spice blends it likely varied from cook to cook.) I also chose to make individual small tarts rather than full-size pies for each table. My goal was to have small portions of each dish to have less wasted food overall. Our dessert course had the most liberties taken in terms of recipes. Tarts de bry were straight out of Forme of Cury. While there were multiple possible interpretations, I chose to use a sweeter more dessert-like interpretation. I also added a bit of brandy to soak my ginger and help bring out its flavor. The stuffed figs were based on two different recipes from Forme of Cury, but, weren’t quite either. Lastly, I wanted to finish with nuts, as was traditional to “close the digestion,” but, I wasn’t certain that people would eat plain nuts at the end of a feast after dessert. So I had a friend who only occasionaly dabbles in the SCA make up candied walnuts for us. Our dessert soteltie was based on Chiquart and Le Viandier‘s information on making fire-breathing happen. We used food-grade camphor, gotten from a local Indian grocery store, which was exactly what was used at the time. It burns beautifully with an orange flame, and starts out solid, making it less dangerous than alcohol since it’s less likely to slosh. (It does however burn hotter than alcohol.) The soteltie was a fire-breathing dragon, based on the description of a dragon in Morte Arthure (the 14th century alliterative Morte). It had a familiar-looking King of the East trying to slay it, and was skewered all over with arrows that matched Her Majesty’s fletching. While I came up with the idea of the dragon, the real work was done by Baroness Alesone Grey and Lady Olivia Bakere. I am incredibly grateful to them for their work. We also had an incredible kitchen staff, to whom we are also so very grateful. Joel asked Mistress Eleanore and Master Jaji to join us. Mistress Eleanore brought Baron Aethelhafac, who in turn brought his wife, Lady Siubhan, their son, and the youngest member of our staff, Fiona. My apprentice-brother Magnus, and my student Finnguala worked in the kitchen with us all day, as did several other members of our Vestfell Farmstead, including but not limited to Lord Guy, Lady Rebekah, and Lady Isabel. Master Toki was available all day in case of kitchen emergencies. Baroness Aneleda heralded our feast into the hall, adapting to any and all changes gracefully and with good cheer. A slew more people came in to help clean up at the end of the day. If I have forgotten someone’s name along the way, I can only plead forgiveness. Joel and I are so very proud of what we all did together. It was a splendid day. Anyone who would like to share their photographs of the feast and especially of the amazing soteltie are encouraged to send them to eastkingdomgazette@gmail.com for inclusion in this article. “The soteltie was a fire-breathing dragon, based on the description of a dragon in Morte Arthure (the 14th century alliterative Morte). It had a familiar-looking King of the East trying to slay it, and was skewered all over with arrows that matched Her Majesty’s fletching.” – LOVE IT!!! The reign is aiming for late 1300s, but the Wars of the Roses were mid-late 1400s. ? I’m confused…. I admit, I’m slightly confused as to where the Wars of the Roses came into this. If I recall correctly, I think Edward’s last reign was set during Wars of the Roses, as a way to meet in the middle with Marguarite’s even later persona. I believe the confusion has to do with which War we’re talking about. It’s in the middle of the Hundred Years’ War, not the Wars of the Roses. I was actually proud of when we could source northern French-derived ingredients, and still have a chance that England owned those regions and could have actually gotten the ingredients, despite the war.